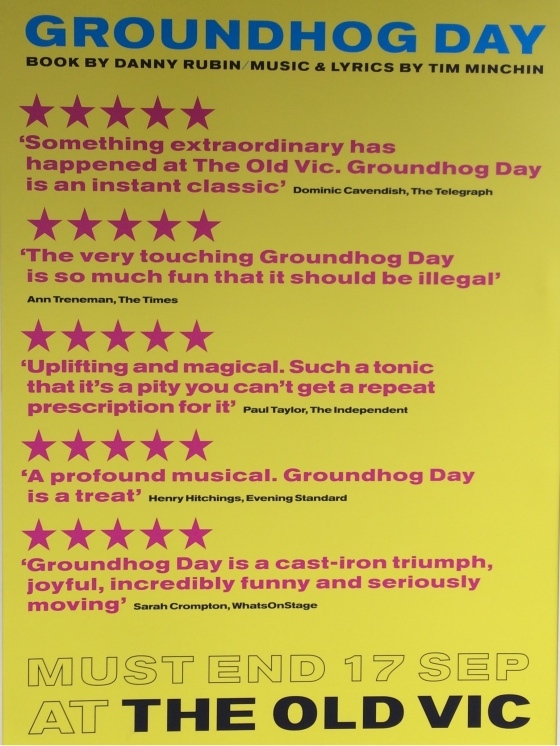 This new musical reunites composer and lyricist Tim, with director Matthew Warchus, choreographer Peter Darling and designer Rob Howell, four of the Matilda The Musical creative team. They joined forces with writer Danny Rubin to collaborate on this show based on his 1993 hit film. 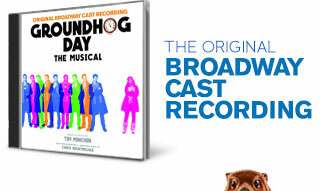 Phil Connors, a cynical Pittsburgh TV weatherman is sent to cover the annual Groundhog Day event in the small town of Punxsutawney, Pennsylvania. Caught in a time loop, he’s forced to relive the same day again and again… and again. As Phil becomes increasingly despondent, is there a lesson being learned and will he ever figure out the secret to break the cycle? 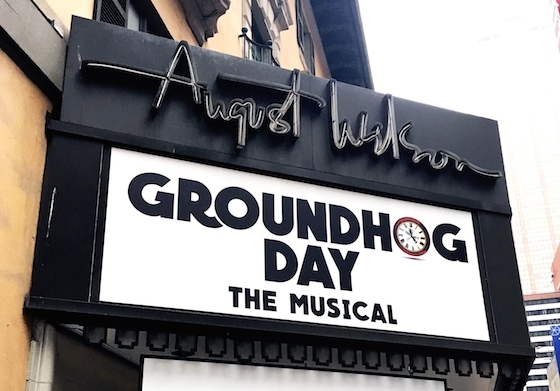 Now on Broadway, Groundhog Day followed an exciting month of previews, from 16th March, with a triumphant Opening Night on the 17th April, 2017, at the August Wilson Theatre. Again, a blizzard of rave reviews rolled in. Andy Karl is reprising his much lauded London performance as Phil Connors, with Barrett Doss playing Rita Hanson. Joining them are the ensemble: Rebecca Faulkenberry, John Sanders, Andrew Call, Raymond J. Lee, Heather Ayers, Kevin Bernard, Gerard Canonico, Rheaume Crenshaw, Michael Fatica, Katy Geraghty, Camden Gonzales, Jordan Grubb, Taylor Iman Jones, Tari Kelly, Josh Lamon, Joseph Medeiros, Sean Montgomery, William Parry, Jenna Rubaii, Vishal Vaidya, Travis Waldschmidt and Natalie Wisdom. 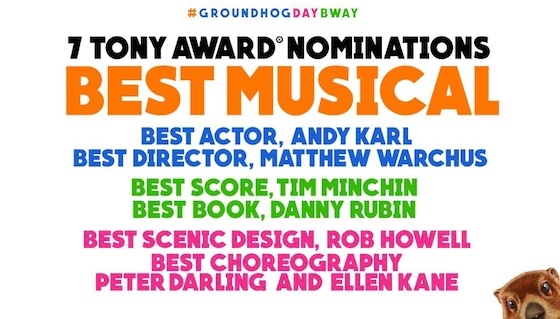 Groundhog Day on Broadway has received nominations for SEVEN Tony Awards, including Best Musical, Best Original Score and Best Performance by an Actor in a Leading Role in a Musical for Andy Karl; FIVE Outer Critics Circle Award nominations; TWO Drama League Award nominations and a Drama Desk Award nomination. 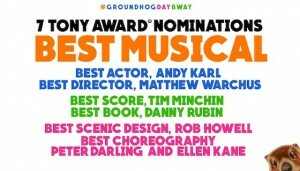 There’s a full list of nominations and wins in the Awards section. Tickets and more information about the Broadway production can be found on the Groundhog Day The Musical website or you can keep up to date with the latest news on the show by following the show’s US social media accounts on Facebook.com/GroundhogDayMusical, Twitter @Groundhogdaybwy and Instagram @groundhogdaybwy. 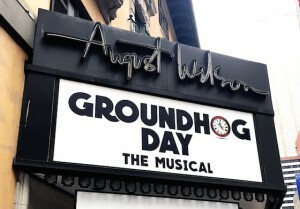 Groundhog Day played its final Broadway performance on September 17th, 2017. The production had played 32 previews and 176 regular performances upon closing. An 18-month US tour* is scheduled to begin next year and details of a London return will be announced in the coming months. *Very sadly, Tim announced on Twitter that, the US Tour will not now take place. 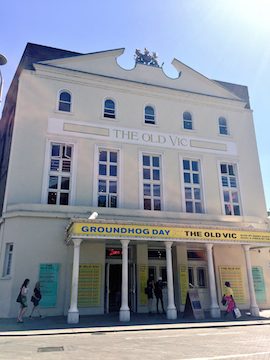 Groundhog Day had its world premiere and enjoyed a critically acclaimed strictly limited 10 week season at The Old Vic Theatre, London, in the summer of 2016. 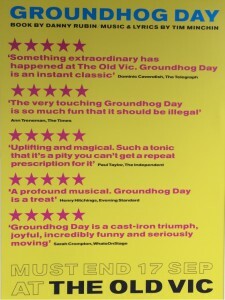 One of the most ambitious shows ever to have been staged at The Old Vic, previews began on the 15th July. 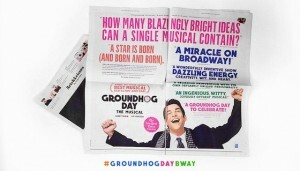 The official Opening Night on August 16th brought in a blizzard of rave 5 Star reviews. The show closed with emotional celebrations and farewells on the 17th September 2016, Broadway bound for spring 2017. 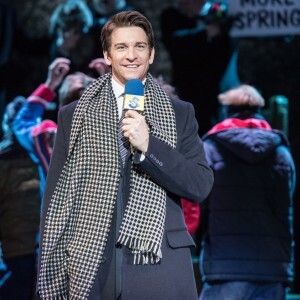 Andy Karl played Phil Connors, with Carlyss Peer as Rita Hanson, his kindly producer, alongside an ensemble cast which included: Leo Andrew, David Birch, Ste Clough, Roger Dipper, Georgina Hagen, Kieran Jae, Julie Jupp, Andrew Langtree, Vicki Lee Taylor, Emma Lindars, Antonio Magro, Carolyn Maitland, Kirsty Malpass, Lisa Mathieson, Eugene McCoy, Jenny O’Leary, Leanne Pinder, Mark Pollard, Damien Poole, Jack Shalloo, Andrew Spillett and Spencer Stafford. The award nominations and wins rolled in, including two Olivier Awards for Best New Musical and Best Actor in a Musical for Andy Karl. Groundhog Day at the Old Vic also won the Critics’ Circle Award for Best Musical and four BroadwayWorld UK/West End Awards including Theatrical Event of the Year. 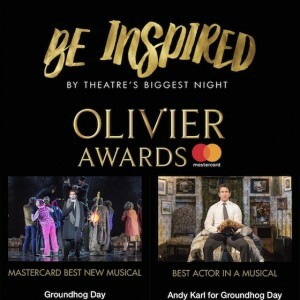 There’s more information on this production, including details of the full creative team, on the Old Vic website, or you can keep up to date with the latest news on the show by following the show’s UK social media accounts on Facebook.com/GhDMusical, Twitter @GhDMusical and Instagram @GhDMusical. (To skip the intro start at 0:36).